（c）Copyright 2012 Kokusho kankokai Inc.
You too can be a grammar king! ●Learn quickly and efficiently important sentence patterns and commonly used idioms, in the carefully selected 100 questions. ●3 modes are installed so you can try ‘Practice Mode,’ ‘Test Mode’ or ‘Special Training Mode’ and learn as much as you want in the way you want. ●Check your weaknesses with the score section. 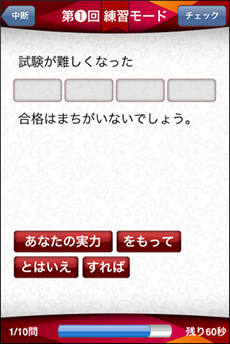 ◎Complete a sentence by choosing the correct answer option for the lighted text box. ◎Each question has a detailed explanation included. 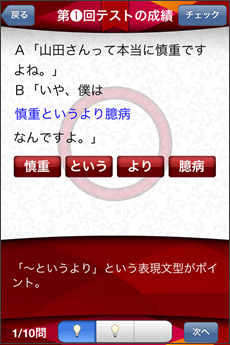 ※Each question has a detailed explanation included. STEP01 is for those who want to challenge N1 level grammar questions. 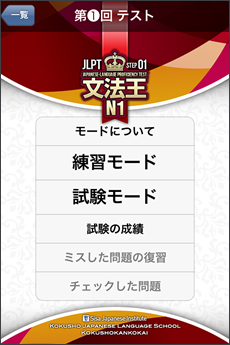 STEP02 is for those who have completed 「STEP01」 and want to try more difficult questions.